By singing the Psalms you can hide the Word in your heart (Ps 119:11). The intent is to urge singing of the Psalms so as to hide the Word in your heart (Ps 119:11). 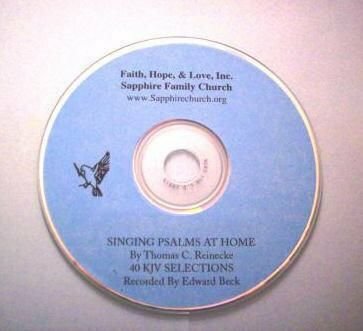 You can learn to sing the PURE WORD of GOD at home and in the car. Over one hour of Scripture Songs with 40 Selections and printed pages of the KJV Scriptures. Produced from the heart in a non-professional setting.